Encores come in a few standard shapes and sizes: the ardent, lyrical cantilena; the short, vapid bit of pure virtuosity; something more enigmatic or contrapuntal. 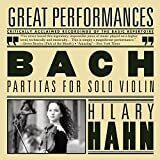 Violinist Hilary Hahn wanted to expand her range of encore choices, so she commissioned a set of new encore pieces from composers around the world. Her recital on Saturday night, presented by the Washington Performing Arts Society in the Kennedy Center Concert Hall, featured the Washington premieres of some of them.